The hunter becomes the hunted when Liam Neeson returns as former CIA operative Bryan Mills, who finds himself framed for the brutal murder of his ex-wife (Famke Janssen). Consumed with rage, and pursued by a savvy police inspector (Forest Whitaker), Mills must rely on his “particular set of skills” one last time to find the real killers, clear his name, and protect the only thing that matters to him now — his daughter (Maggie Grace). I seen the previous 2 movies in this series and I really liked them so when I received Taken 3 to review I just couldn't wait to watch it. If you are a fan of Liam Neeson and of action packed movies then you will most likely enjoy this one. I didn't find it as good as the first or second movie but it was still good and it kept me entertained . The action and action were all great but it had some predictable twists. 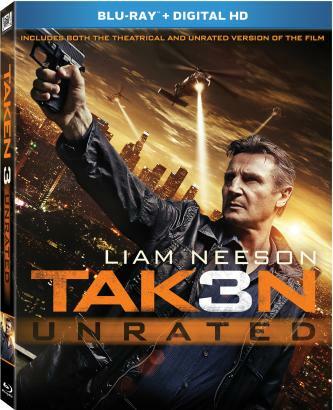 Taken 3 is now available online and in stores near you.